Do you have updated marketing materials for your business? There are many reasons why you should. This is part one, of a three-part series on making your takeaways work for you! What do I mean by takeaways? Business cards, brochures, samples, flyers, postcards, anything that you handout at a tradeshow or your place of business that will keep your potential customers thinking about you and your products or services. If you want to stand out among the competition, it is critical to make a lasting impression. The pieces you hand out should be strongly branded and attractive. They should also be memorable. When we talk about branding, it is important to incorporate your color scheme into all of your materials. The colors used in your logo should be used throughout all of your marketing efforts. Your website, business cards, flyers, packaging, etc. should all operate from the same color scheme. Consistency is key. It sometimes can get expensive to print pieces yourself. Oftentimes it is better to outsource some of this. Not only can it save you some money, pieces often look better when printed professionally rather than on your home computer. Online vendors such as UPrinting offer full color brochure printing that can save you time and money. Consistency really is the most important component to your overall marketing and branding strategy. You wan t your customers to become familiar with you and recognize you immediately. Consistency definitely helps with this. Stay tuned over the next couple of weeks for more in this series. We’ll talk about what should be included in your marketing collateral and how to most effectively distribute it! 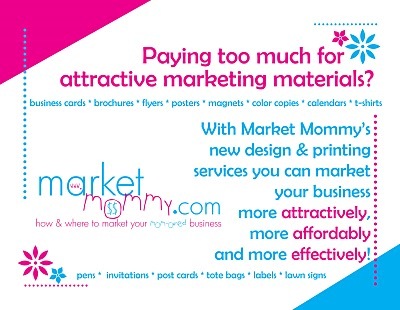 Market Mommy now offers full service design and printing services! You’ve heard me say over and over how important strong branding and consistency are. You’ve also heard me say several times that effective marketing can be done on a limited budget. Mom entrepreneurs face their own unique set of challenges. Finding marketing and business supplies at a reasonable cost shouldn’t have to be one of them. That is why Market Mommy has expanded our design services and now can offer you full service printing without the inflated full price. For a complete price list click here. All businesses need to be able to present themselves in a positive, professional manner. Market Mommy can help you do that with attractive business cards, brochures, note cards, promotional items, postcards and much more. • All prices include FREE design work/corrections and up to 3 proofs! AND printing! • Orders over $100 always receive free shipping! • Don’t see quite what you’re looking for? We can quote ANY project! • Need to reorder? Contact us for a discounted quote! Remember, these prices all include custom design work! You will not find lower prices on custom marketing materials anywhere! We also offer magnets, flyers, envelopes, oversized postcards, presentation folders, stamps, lawn signs, car door magnets, t-shirts, calendars, gift certificates, posters and much, much more! Contact us today to see how we can help you promote your business! Don’t forget, we also offer a referral program! Contact us for details and find out how you can earn credits for free products! P.S. Mention this blog post and place an order before April 1 and you’ll save 10% automatically!